Figure 1. Graphic representation of a DCA. 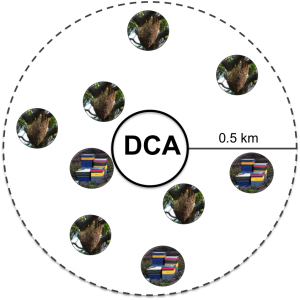 All of the colonies shown (feral and managed) within the 0.5 km radius could send drones to that DCA. At the UF HBREL we love when our science has practical applications for Florida beekeepers. Below is a summary of one such study with African and European honey bee colonies. Hypothesis: The presence of managed European honey bees can decrease the number of nearby African colonies. As you can imagine it is extremely difficult to locate all of the feral honey bee colonies in a region. However, we were able to estimate the number of colonies and their ancestries (African or European) through drone congregation areas (DCAs) and genetic analysis. As the name suggests DCAs are areas where male honey bees congregate; here they wait mid-air for a honey bee queen to visit in anticipation of mating. Honey bee drones only travel short distances to a nearby DCA (typically less than ~0.5 km away from their hive). Therefore if you can find a DCA, the drones present there are likely representative of all the colonies (managed or feral) producing drones within a 0.5 km radius (Figure 1). Figure 2. Drone trap that is suspended from a large weather balloon within a DCA to collect drones. DCAs close to managed European colonies had a lower percentage of African drones at them than did DCAs far from managed European colonies. African drones present at DCAs near managed European colonies came from fewer colonies than African drones at DCAs far from managed European colonies (Table 1). Table 1. Maternal groups of drones trapped at DCAs close to or far from managed European colonies, and proportions of those groups with African genetics. Figure 3. Ashley (HBREL graduate student) conducting molecular analysis of the drone honey bees collected at the DCAs. By decreasing the presence of African drones at DCAs we can decrease the chance that virgin queens will mate with African drones at those DCAs. However, more information is needed to determine how beekeepers could integrate this strategy into a practical breeding program, because queens travel farther to DCAs than drones do. Changing the proportion of African drones only at DCAs nearby apiaries likely does not modify the proportion of African drones that virgin queens may encounter. We need further research to know what concentration and distribution of managed European colonies could change the regional reproductive population to the extent that virgin queens produced in a European apiary would attend a DCA with a high proportion of European drones. Have something to say? Join the discussion on our Facebook Page (www.facebook.com/UFHoneyBeeLab/). 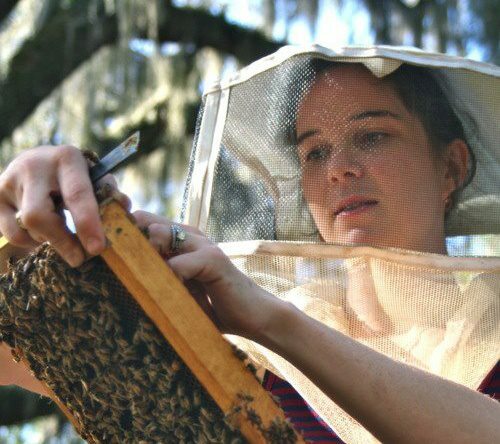 Doctoral candidate at the University of Florida Honey Bee Research and Extension Lab. 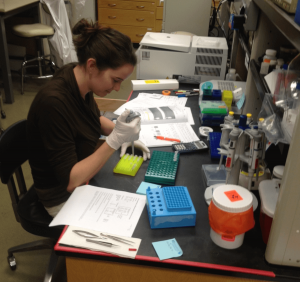 Mortenson’s current research focuses on the behavior effects of in vitro rearing on adult honey bees.